Catooine. Or Wisconsin, I can't remember. The End of Time, Male, 23, from Catooine. Or Wisconsin, I can't remember. I know this is quite a dumb question, but the Cerpine are... dead, are they not? I am atrocious at modding, but with your permission, I'd like to try my hand at resurrecting the most badass reptiles in the galaxy. http://community.playstarbound.com/threads/starbound-forums-rpg-video-game.112276/ My final gift to the forums. Check it out! Hi, friend! How are you today/night? Your Avatar seems pretty cool. Where is it from? Oh? Sorry, forgot to introduce myself. I'm kisspower12. You can call me "kiss" if you like. If you want to know where I'm active, it's on the Terraria Community Forums. I go by the same name there. 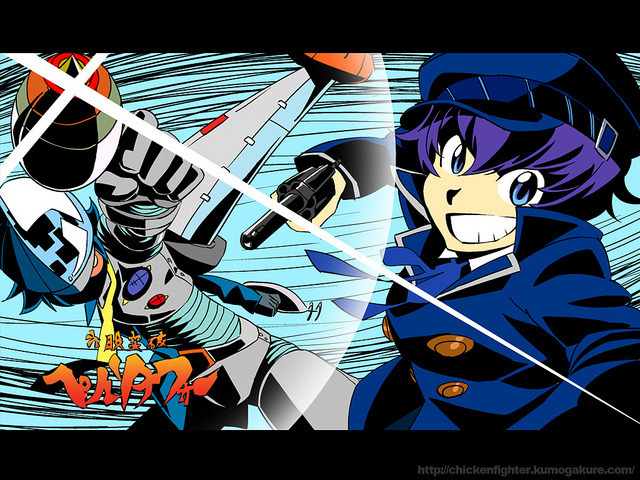 My avatar is a picture of Naoto Shirogane from Persona 4, only drawn in the style of Tengen Toppa Gurren Lagann. Here is the full picture, should you want it. Oh? If I ever do decide to join the terraria forums, I will look you up. Thanks so much! Have a K-A-W-A-I-I day! Even if no one plays it, I don't care. I said I would finish it, and by god I will. It will be my final work here. A reminder of all the pleasant memories I had. Guess this avatar is as good as any. More like one AWESOME Yosuke! Why is every post on here liked by CandleKitty?! WHY IS IT SO COLD?! Not cool, Wisconsin! I can finally don an Adachi avatar again. Your avatar is looking at me funny! My avatar was originally supposed to be a GIF, but it appears the forum/gravatar no longer supports that. Kill la kill is like a can of concentrated joy. Stupid, blissful, violent joy. CandleKitty and Kreuz Drache like this. Some of the new mods seem a bit... Strict. But maybe strict is just what the forum needs right now. CandleKitty, Serenity, beari78 and 1 other person like this. Strict is the last thing a game needs. The last thing i want is some ponce telling me what's right and wrong when i have a giant world to explore.. I meant here on the forums. I just now noticed the Persona 4-ish forum logo so now I feel the need to thank you for that one, cause it's the best. ...At least I hope it's P4 else I'm gonna feel really dumb. Indeed, really good game. Good enough for me to grab the premium edition of Golden and feel it was worth it. I personally cannot wait for Persona 5 and Persona 4 arena Ultimax. I might even consider getting a 3DS and playing Persona Q.
Oh yes, Persona Q looks cool. It's not my main reason for wanting a 3DS, but it'll be a thing to get. You mean Sigilyph? That's a Pokémon that was giving me trouble. CandleKitty and Raptoral ze great guy like this.